Catholic churches in Skowhegan, Madison and Bingham will be getting a new priest. As of July 1, the current pastor of the Roman Catholic Christ the King Parish, with churches in Skowhegan, Madison and Bingham, will be retiring. The Rev. John Mazzei, a member of the Franciscan Friars of the Atonement order, came to Christ the King from Corpus Christi Parish in Waterville on July 1, 2011. The Rev. 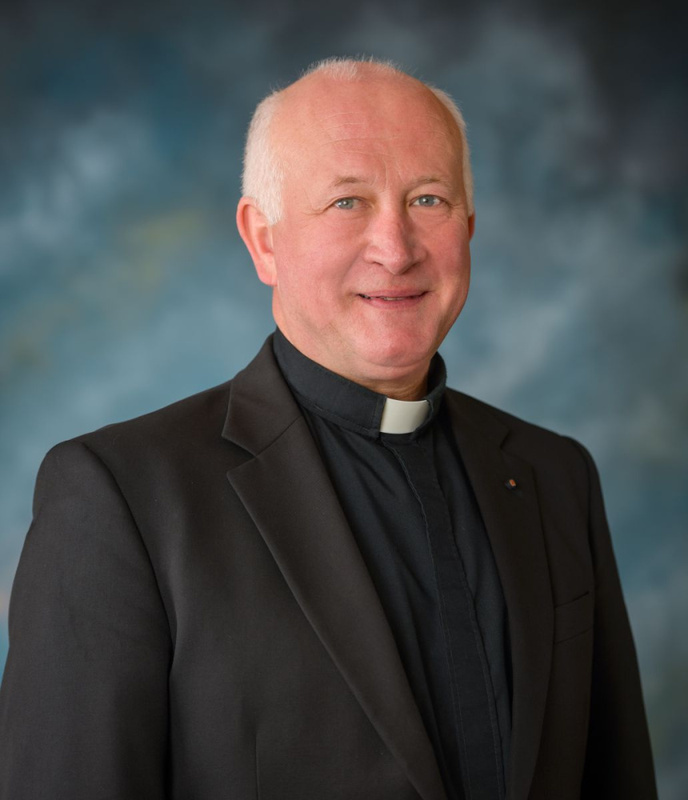 James L. Nadeau, who now is pastor of St. John Vianney Parish at St. Louis Church, in Fort Kent; St. Mary Church, Eagle Lake; St. Charles Borromeo Church, St. Francis; and St. Joseph Church, Wallagrass, will be his replacement. Bishop Robert P. Deeley, of the Portland diocese, announced six new priest assignments and a retirement in April. The member churches of Christ the King Parish are Notre Dame de Lourdes Church in Skowhegan; St. Peter Church, Bingham; and St. Sebastian Church, Madison. Jane Shaw, at the Madison Public Library, said Mazzei will be greatly missed, especially by some of the older parishioners at St. Sebastian. Shaw said Mazzei started a program at the church for children’s liturgy, which she helps with, and sees to the spiritual needs of the older church members. In Skowhegan, Road Commissioner Greg Dore said he is a regular participant at Notre Dame de Lourdes Church and will miss “Father John,” who made going to church fun again. “He’s a really nice guy in the sense that he has a great personality, easily liked,” Dore said Thursday. Dore said a lot of times with routine reassignments of Catholic priests, there are pastors who might not be as interesting as Mazzei. Mazzei also helped local volunteers at St. Peter Church in Bingham open a thrift store and a food pantry in the former Jimmy’s Market in January. Sonny Lagasse, who helped get the thrift store and food pantry started, said Mazzei’s retirement is a mixed blessing. Lagasse said Mazzei was a big part of getting the food pantry started, and the pantry and thrift store are now well on their way to success, thanks to him. “We’re thankful for his efforts and we’re happy he’s going to get a chance to enjoy his retirement, but we’re going to miss him,” he said. A native of Lincoln, New Hampshire, Mazzei completed his clerical studies at Regis College in Weston, Massachusetts, and Seminario Santa Cruz do Sol in Brazil. He was ordained to the priesthood on May 9, 1992, at Paroquia Santo Inacio de Loyola de Lajeado, part of the Roman Catholic Diocese of Santa Cruz do Sol, according to a news release from the Portland diocese office. Mazzei arrived in the Diocese of Portland in November 2008 as parochial vicar of Christ the King Parish and Corpus Christi Parish in Waterville. His replacement, Nadeau, was born in Caribou and graduated from Caribou High School before earning a bachelor’s degree in 1983 from Dartmouth College in Hanover, New Hampshire. He completed his clerical studies at the Pontifical North American College in Rome, Italy, and also earned degrees from the Gregorian University in Rome. He was ordained to the priesthood by Bishop Edward C. O’Leary on July 9, 1988, at Holy Rosary Church in Caribou. In November 1993, Nadeau was appointed temporary administrator of the Cathedral of the Immaculate Conception Parish in Portland. In May 1994, he was named rector of the Cathedral of the Immaculate Conception. In August 2005, he was appointed administrator of St. Louis Parish in Fort Kent. In 2014, Nadeau was named the recipient of the Maine Educational Opportunity Association Achiever Award for his educational accomplishments as well as his dedication to providing educational opportunities for low-income and first-generation college-bound students who hope to find success in higher education, according to the news release. Nadeau is also a knight commander of the Equestrian Order of the Holy Sepulchre of Jerusalem, a worldwide charitable organization that supports Christian schools in the Holy Land.